What front shocks do you run? What brand/model is the preferred? My XJ have about 4.5" of lift, using Currie 9131F coils that are about 170# (I think the OEM were 140#) and Bilstein 5150 shocks that have 10" travel. I need to replace those shocks with some good DD shocks that will not break the bank. There are a few offerings out there that have stem at the top instead of an eye and they are my preferred. Who have some on sale? You want to get rid of billys for parts store shocks??? i daily with 5in lift 3link long arms etc and 5100s... rides like a cloud. OK! Got you. I just never heard that term. I am leaning towards Bilstein but did not want to close my mind to other good units. I see some really good reviews for the 5100. What valving are those Bilstein's you are running? The 255/70 seem to drop out fast and allow the tires to bounce sometimes rapidly. This is especially true since I added bigger brakes and larger tires. I've been running Rancho 9000's for 20yrs now and love their adjustability(on the shock, not remotely). I also see where KYB now has the same feature and I've been running KYB's for 40yrs! Dirk specialize in OME. What is the valving on those? I have OME. With the WJ LCA's, I keep being amazed how comfortable it is. I Jeep, therefore, I am..
Doetsch shocks have always served me well for my mildly built DD. 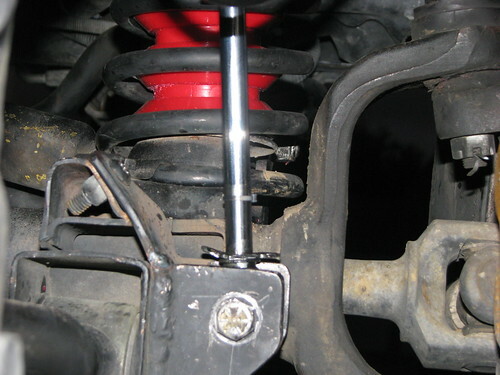 With shocks, you get what you pay for, assuming you pick the right length and valving. I switched from Bilstein 5100s to the 5165s, what a huge difference is ride quality. The 5100s are very stiff in comparison, you feel every small bump. The 5165s float over smaller bumps but tighten up on bigger hits. With the 5165s, I can drive faster over rough terrain, in greater comfort and control. The ride can be improved more as you move up the price range into even better shocks. I agree with your reasoning 100%. comments like yours is the reason I ended up with 2 threads on the same subject. I needed to hear from others who have first hand experience on various shocks. My first thread had only a few useful comments. Your 01 XJ have similar specs to my XJ,... when I add a bumper and winch is should drop at least 1/2" from the 4 1/2 it is now. What valving are the 5165's. I think 255/70 valving are good out back but the front could use something with less drop out/rebound. And for some unknown reason I am partial to Bilstein but open to other manufactures. I'm running 255/70, front and rear. 90% of my driving is on the pavement where a little softer ride is appreciated. You might want the 360/80 valving, if a stiffer front end is desired. I did go with the 5165 with 11" travel. Not many miles on them at this time just a few highway miles at moderate speed. They are quite an improvement over those I had previously which were installed sometime in 08. Most noticeable is the reduction in body roll. They have eye on both ends. I had to use an adopter which added 1.5" to the overall length. Now I need to add another inch to the bump stops which would reduce up travel by an inch. How can I regain some of that lost up travel? I have not yet come up with an easy solution but I need to. Thanks all for their input. It have been well appreciated. They have eyes on both ends. I had to use an adopter which added 1.5" to the overall length. Now I need to add another inch to the bump stops which would reduce up travel by an inch. How can I regain some of that lost up travel? I have not yet come up with an easy solution but I need to. I chopped the stock, lower mounts off and welded up two simple adaptors to adjust the lower shock mounts for full up and down travel. The LCA bolt secures the adaptor, along with a button head bolt.